Nike didn’t think it was possible, but they managed to improve on perfection. 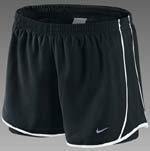 It’s all about the Nike Tempo Two-In-One 10cm Women’s Running Shorts. Taking the beloved Tempo profile, they added compression shorts for a more supportive, streamlined design that’s ready to roll and log those miles. Fabric: Dri-FIT Body and mesh: 100% recycled polyester. Compression shorts: Dri-FIT 92% recycled polyester/8% elastane.